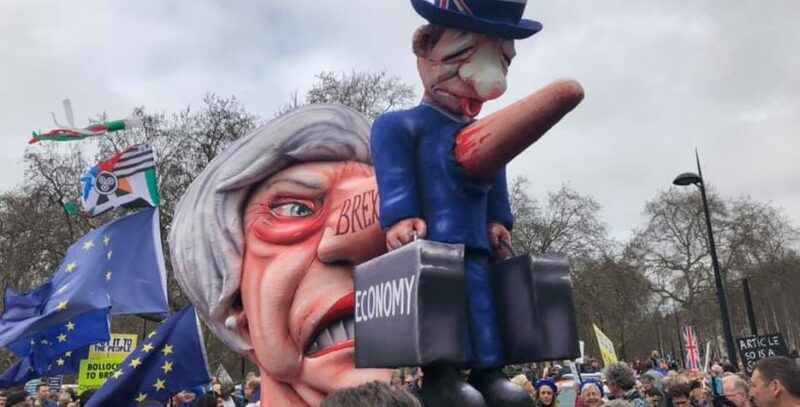 On Saturday 23 March a vast crowd, estimates of whose number varied from hundreds of thousands to over a million, marched from Hyde Park to Westminster Square to propose the idea of a second vote (‘Put it to the People’) on Brexit; and by Sunday more than five million had signed a petition calling on the government to revoke the article 50 notification of Britain’s intention to leave the EU. 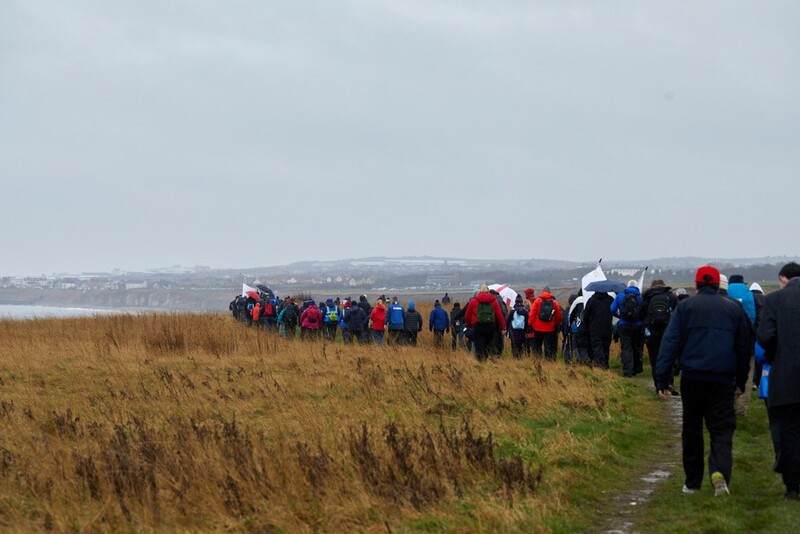 Meanwhile, a long walk organised by Leave Means Leave continued its 200-mile tramp to London, with barely a couple of hundred taking part. On Sunday 24 March the Prime Minister held crisis talks at Chequers, her country retreat, with a number of mainly right wing pro-Brexit conservative MPs amid talk of a leadership challenge or interregnum, but the day seems to have ended with Theresa May still in position, if not fully power, and no one else having any very clear idea what might happen in Parliament in the coming week or whether she would once again propose her twice-rejected withdrawal agreement. There often seems to be a sort of magical thinking being applied to the problem of Brexit, according to which it is simply a matter of changing just one thing — the Irish backstop, the customs union, the exit date, the Article 50 notification, even the person of the Prime Minister — and all will be well, or at any rate able to proceed. Somehow, this seems doubtful. On the UK Constitutional Law Association blog, Alexandra Sinclair and Joe Tomlinson discuss the alarmingly extensive use of statutory instruments to enable Brexit: Brexit, Primary Legislation, and Statutory Instruments: Everything in Its Right Place? On the UK Human Rights Blog, Rose Slowe of Foundry Chambers suggests that No Deal Brexit may be unlawful and that (contrary to the widely held assumption) “without an Act of Parliament authorising Brexit in whatever form, the legal default is that the Article 50 notice issued will lapse, if not unilaterally revoked”. Contrasting decisions on the identification of murderers have been made in England, Scotland and New Zealand, in each case in relation to cases that have attracted significant media attention and provoked widespread public horror and revulsion. Subsequently, it emerged that a number of people including a well known TV star had been committed for contempt of court in purporting to share on social media information in breach of the restrictions. Campbell could be named by the media because the judge had earlier set aside the reporting restrictions under a court order which had protected his identity because he was under the age of 18. (BBC: Alesha MacPhail murder: Judge lifts ban on naming killer Aaron Campbell.) Once he reached 18, he could have been named anyway. However, it seems that the law in Scotland was only changed about three years ago, and that prior to that date the age threshold for being named was 16. Of course, the fact that his real name has been revealed (as was that of Jon Venables) does not mean he may not assume a future new identity, either in or outside of prison. But there might be another and better reason for preserving — or imposing — anonymity. Following the recent New Zealand mosque mass-shootings, the Prime Minister Jacinda Ardern made a point of NOT naming the killer, telling the New Zealand parliament: “He sought many things from his act of terror, but one was notoriety — that is why you will never hear me mention his name”. (BBC, Christchurch shootings: Ardern vows never to say gunman’s name) Campbell was not only a casual and brutal killer but he was also, in his own view it seems, a bit of a star, making selfie videos in the style of social media influencers. There is always the risk of influencing the wrong sort of behaviour, and it has been suggested that keeping notorious criminals anonymous decreases their potential to inspire ‘copycat’ offending. (USA Today, A single decision by New Zealand’s leader may prevent copycat killers) Presumably one could extend the principle to media coverage altogether, but it would be impossible to enforce a blackout in most cases, as well as being an interference with freedom of expression that would be hard to justify as necessary in a democratic society. However, New Zealand’s Chief Censor made the possession and distribution of the gunman’s manifesto unlawful there. If the denial of the oxygen of publicity really could prevent future mass shootings, that would at least justify some measures of suppression. “The Personal Injury Discount Rate (‘PI discount rate’) is used to determine lump sum damage awards to claimants who suffer a serious personal injury. Historically the Damages Act 1996 provided for the Lord Chancellor to set the PI discount rate, and this was done on the basis of principles set out in case law, principally the decision of the House of Lords in Wells v Wells  1 AC 345. Under these principles the PI discount rate has been set with reference to yields on Index-Linked Gilts — resulting in a current rate of RPI-0.75%. On 20 December 2018, the Civil Liability Act 2018 received Royal Assent, thus introducing a change to the way that the PI discount rate is to be set in the future under the Damages Act 1996 (‘the Act’). The Transparency Project have recently made some minor updates to a number of their guidance notes. They have updated the pdfs of each, which are free to download and use, and will shortly be updating the online web versions too. The guidance notes are free to download, but if your organisation would like some hard copies of the guidance note they have a limited supply available, thanks to funding / sponsorship from the Legal Education Foundation and Bloomsbury Professional Family Law. Please email them if you would like some. The Times legal department has expanded its links with leading law firms and barristers chambers in offering fellowships to trainees to “give trainees and junior lawyers the chance to work with its in-house legal team, and to nurture new talent in media law.” The fellowships have been created in conjunction with a number of leading firms and chambers, including law firm Reynolds Porter Chamberlain and chambers at One Brick Court (while it continues to exist, presumably), Matrix and Doughty Street. On 27 March we will be launching our Research & Development portal, with a brand new website and news of exciting projects and collaborations. All will be explained in a separate post on the blog. Last week Daniel Hoadley, Head of Design and Research at ICLR (aka @DanHLawReporter), and Paul Magrath, Head of Product Development (aka @Maggotlaw ), attended the Legal Futures conference on the Future of Civil Litigation. We’ll be writing a separate post about this. The Foundation for Law, Justice and Society published a post about the Putney Debates 2019 in which Magrath appeared on a panel chaired by Joshua Rozenberg on the subject of judicial independence. UPDATE: you can now watch the video of all the sessions, including the one in which Magrath spoke (from 33 mins in). NB Next monday we’ll have a special feature on the blog to mark the first of the new month. I'm thinking of proposing a change to the Criminal Procedure Rule Committee which permits repeated requests for a jury to return verdicts until they reach one with which I agree. What could we call it?